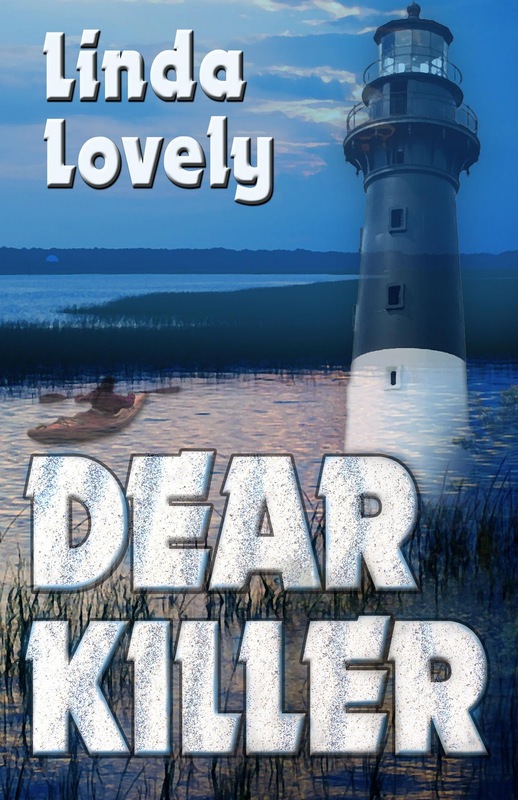 Congratulations to Jo-Ann, the winner of a copy of Linda Lovely's DEAR KILLER! Thank you to all who participated! What’s so special about romantic suspense? Romance and danger are two sure-fire triggers to get your heart thumping. This applies to readers and movie fans. Combine romance and suspense and you have a double threat. Inject a dose of humor and, in my opinion, you have the trifecta. I’m going to use movie examples because I have too many favorite books and authors to single out a handful to prove my point. Classic romantic suspense movies include North By Northwest and Charade. These films endure because they’re loaded with suspense, and they up the personal stakes for the hero and heroine by giving them an irresistible attraction to a love who appears—at least at times—to be the enemy. Add witty dialogue for Cary Grant, the star of both of these films, and you have a barn burner. Even recent shoot-em-up movies rely on love as an added motive for heroes or heroines to risk all in order to save their sweethearts. Examples that come to mind include Eagle Eye and Die Hard. These movies have something else in common—strong heroines. That’s something else I look for in romantic suspense novels. Having been raised by a strong-willed single mother, who taught me women can do whatever they set their minds to, my favorite romantic suspense plots feature feisty heroines, who don’t take any guff from heroes and stand ready to act as equal partners. My favorite romantic suspense novels often feature heroes or heroines who have enough life experience (and baggage) to make them intriguing. In my debut novel, DEAR KILLER, my security guard heroine (ex-military) is smart, athletic and funny. That proves an irresistible combination for the deputy/hero assigned to lead a murder investigation on the Lowcountry Sea Island where she works security. The fact that she’s 52 and he’s 40 adds even more fuel to their internal conflicts. Linda is one of the many talented authors who belong to the Romance Writers of America’s Kiss of Death chapter. At Kiss of Death we believe that every great romance should include suspense. Whether a spy thriller in Regency times, a paranormal romance with a revenge-seeking zombie, or a traditional serial killer after the heroine, romance relies on suspense, leading the reader through the trials of the heroine and hero to see if they will get their happily ever after ending. If you can call your writing suspenseful, then the Kiss of Death has something for you! Find out more and join at http://www.rwamysterysuspense.org and follow us on Twitter at @RWAKissofDeath. Find out more about Linda on her website at www.lindalovely.com. Giveaway alert! Please comment about your favorite aspect of romantic suspense. At 9:00pm EST on Jan. 15, one lucky commenter will win a copy of DEAR KILLER. Marley Clark, a retired military intelligence officer, works security for a Sea Island community simply to keep busy. A single night patrol transforms the feisty widow’s yawner of a job into a deadly battle of wits when she finds an islander drowned and bobbing naked amid a potpourri of veggies in a Jacuzzi. Asked to serve as the lead investigator’s liaison, the 52-year-old heroine is startled to discover she’s become Deputy Braden Mann’s target as well—for romance. Yet their steamy attraction doesn’t deter the pair from sorting through a viper’s nest of suspects as the body count grows and the pun-loving killer plans a grizzly epitaph for Marley. DEAR KILLER is the first in a series of Marley Clark adventures that dish up heart-pounding suspense with a side of romance. Romantic suspense is what I enjoy the most. I love reading all romance novels of any kind but are drawn to series such as Bullet Catchers, Bodyguards, Fatal, Death. Can't wait to try Dear Killer. Thanks, Laurie. There's so much variety in Romantic Suspense--and I enjoy it all from the dark to the humorous. One movie came to mind, Linda, and it's one I doubt many would even think of: African Queen. The romance between the hard-drinking Humphrey Bogart and the strait-laced Katherine Hepburn amid a backdrop of danger is a great departure from what we see and read nowadays, yet it's no less romantic because we root for these two. I love writing RS and putting my H/h into unlikely situations. What's a mystery or thriller without a little romance? Boring, I say. Polly--I agree. African Queen is a great romantic suspense with "flawed" characters and lots of internal and external conflict. Perfect example! If you had asked be sometime back about romantic suspense, my answer would have been no, not my cup of tea. Recently I have discovered I actually do like it when done well. Dear Killer is definitely well-written and thouroughly enjoyable. Nice to be proven wrong in a way that opens the door to an entire sub-genre. Please remove me from contention for the free copy as I am the proud owner of a signed copy. Thanks for the vote of confidence, BJ. So glad my heroine was convincing to a former policewoman! We all love the romance, the HEA, but when you add suspense, you not only get the ferris wheel, you get the rollercoaster too. What a ride. Love to win a copy of your book. Good luck to you in the drawing. I'm always delighted to support great writer groups like RWA's Kiss of Death chapter. If you're a writer, be sure to check out the Daphne contest, which just opened. Congratulations, Linda. Dear Killer sounds fascinating. I love writing and reading romantic suspense for exactly the reasons you described! Laura, your book sounds wonderful. I can't wait to read it!!! I love the setting and strong heroine, and the humor is an added bonus. Definitely a winning combination!!! Thanks for dropping in,Jo-Ann, Kristine and Gail. It's always nice to hear from other Romantic Suspense fans. I love romantic suspense. My favorite part is when the hero and heroine outwit the villain in the end. I'm a big fan of romantic suspense. At some point, contemporary romance wasn't doing it for me. I needed something more and I found that the tension, the suspense, the twists and turns gave it to me. The romance was just an extra. I've been buying and reading romantic suspense for a very long time. I used to get very upset when the industry was saying that no one wanted to read it - I was grabbing up everything I could find! Tammy--Yes! That's one of the reasons that writing Romantic Suspense is so difficult AND rewarding. Your villian needs to be smart and seemingly invincible. If your villain isn't tough enough, your hero and heroine don't face enough of a challenge. But when the villain's a worthy adversary and your h/h triumph, it makes the whole read worthwhile. Karen--I'm with you. When I heard those industry rumors, I kept wondering who they were polling. They sure weren't talking to the avid readers I know. I don't think the genre will ever go away--especially since there is room for lots of variation and subgenres.